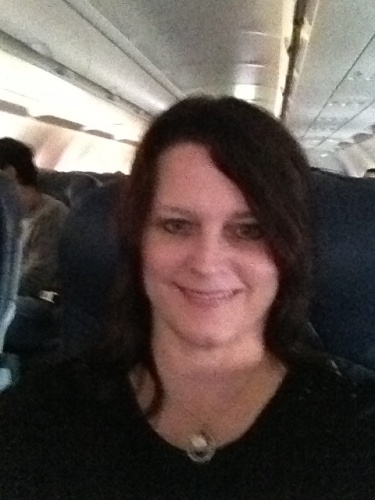 This weekend I attended Caterina Rando‘s Sought After Speaker Summit in Los Angeles, California. It was GREAT professional speakers’ training. 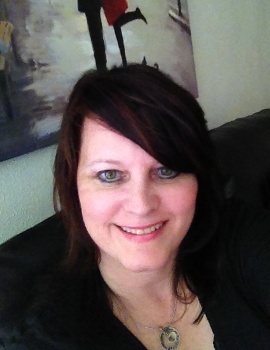 Caterina has an advanced speakers’ training program next year that I’d love to join; I’m praying about it. Please pray I hear God’s voice clearly about it. I felt the Holy Spirit nudging me about going, but thought it’d be impossible for me to go due to the cost ($497), PLUS the air fare, PLUS the hotel room expense for 3 days, PLUS our rent was due, PLUS some utilities and groceries. When you have a business, you MUST invest to see a return! By the time my birthday week came around, I was trying to make a decision between visiting my precious friend Rochelle Valasek (aka “Shelley), or to attend this training. I was praying about it the night before, when the price for Caterina’s training suddenly dropped $400 one morning to just $97! I prayed again, talked to Ray once more via email (he was at work), then registered online. Caterina’s husband told me when I registered that was the very last date to get the reduced hotel rate. God is always right on time! 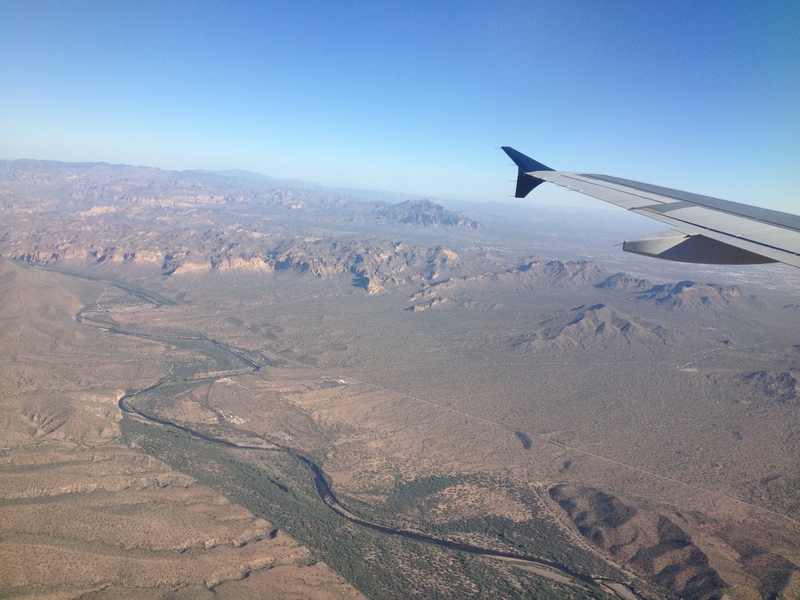 On the first plane from Kansas City to Phoenix, Arizona, I believe I may have encountered an angel sitting beside me. No joke! The experience was similar to the one when I rode the train back after I spoke in Canada. My family and my friends are sure the man accompanying me the entire train ride from Canada was a guardian angel. Maybe God thinks I am just high maintenance and need extra (i.e., angelic) help down here on earth, LOL. This man on the plane to Phoenix, as I was flying to Los Angeles for the speakers’ training, was an older man, said he was a truck driver, and was married, with two grown children. But the entire plane ride, he talked to me about God, the security of a believer’s salvation, the book of Revelation, and he seemed to have revelatory, prophetic words of knowledge about me, without me telling him my personal life (In a non-scary, non-creepy way). 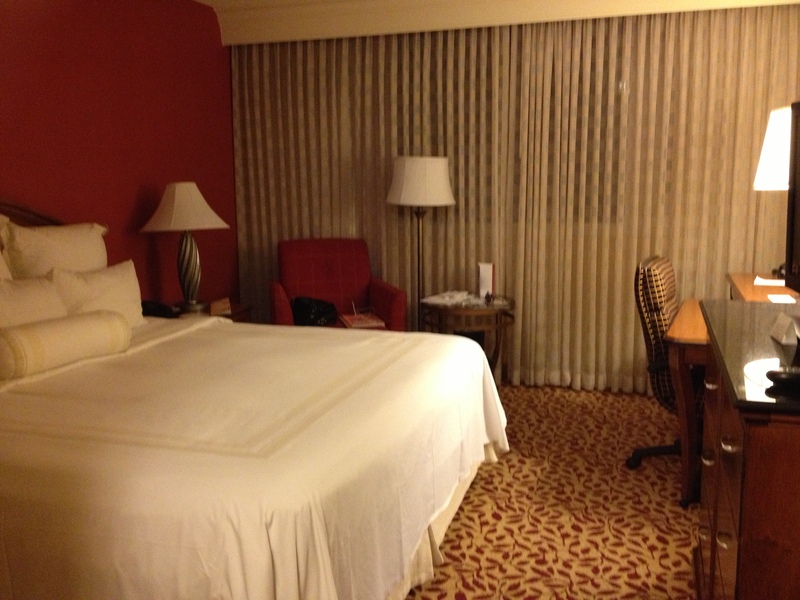 And this was before I even arrived in LA! I arrived in LA last Thursday night. Of course, I had to immediately drop off my luggage in my room and then explore a little. I.e, take lots of pics for my blog!!! You knew I would! The bed was heavenly! 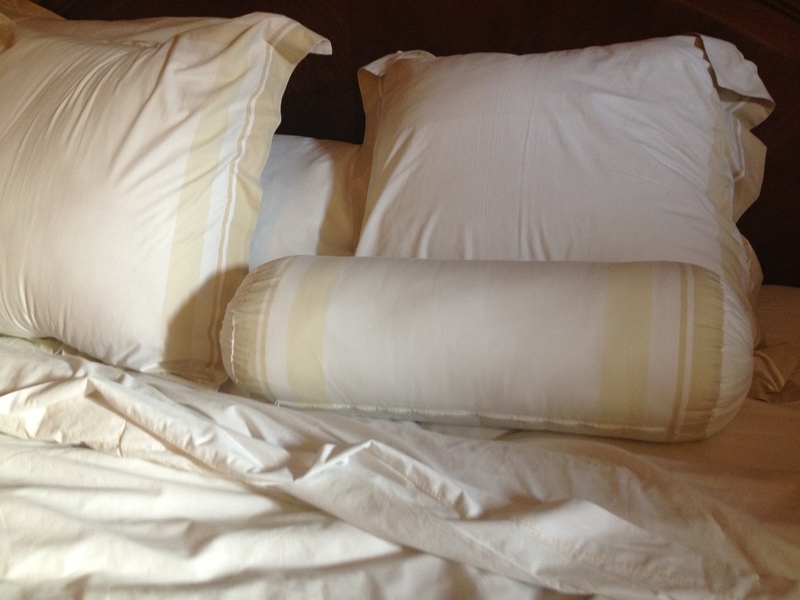 Once again, the next morning as I awoke, I squeezed the soft, comfortable pillows like Georgia Byrd (Queen Latifah) did in The Last Holiday movie, and I laughed out loud. Yes, I slept wonderful! 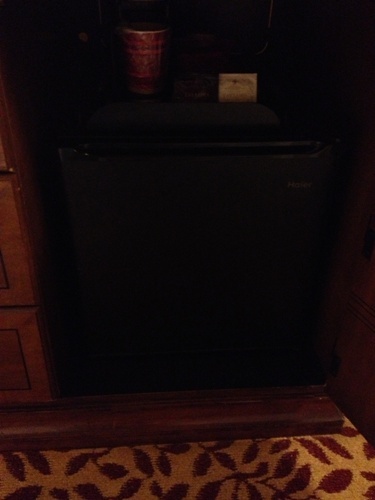 Our daughter Leah likes little fridges, so I took a pic of the one in my hotel room. Our family is easily amused, including me. 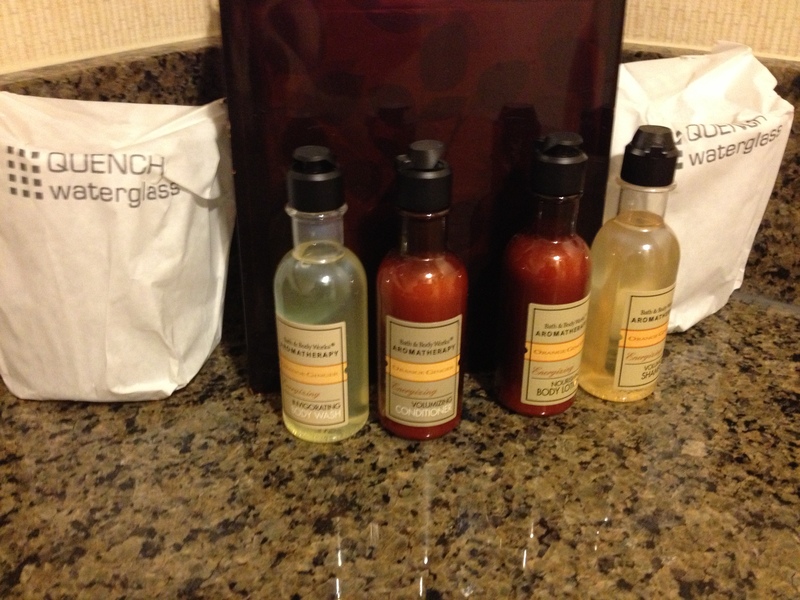 Leah also likes the little shampoos, conditioners, body wash, and lotions that hotels have so I brought her a few. The Marriott’s looked like tobasco sauce. Leah and I both laughed at this. 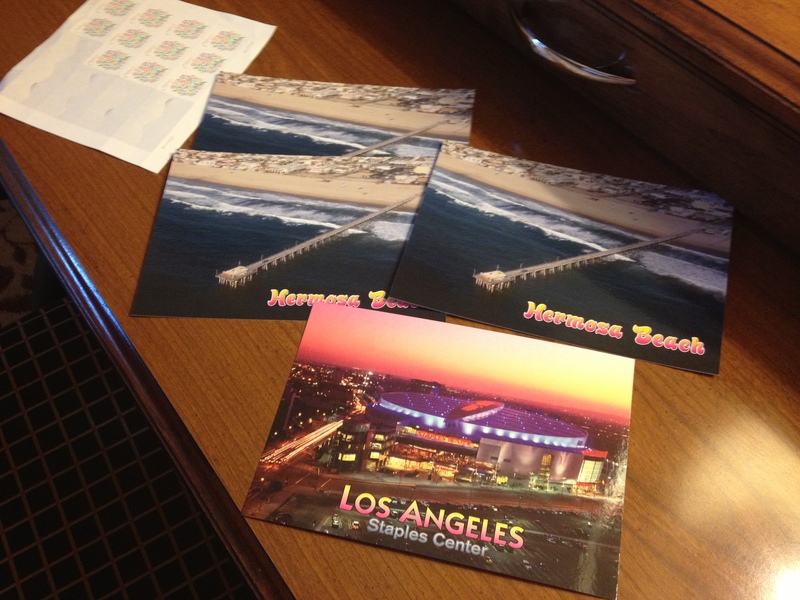 I usually try to get souvenirs for my family when I travel somewhere, but due to the extra expense this time, I had to settle for LA postcards and a little chocolate! They liked the chocolate. 🙂 The one HUGE disappointment I had with this trip was not going to the beach, which was so close. The training on Friday lasted until 9 p.m., and on 5 p.m. Saturday. I was concerned I’d miss my plane if I tried to go on Sunday morning – although I now regret not taking the risk! But I did get some much needed R&R Sunday morn! 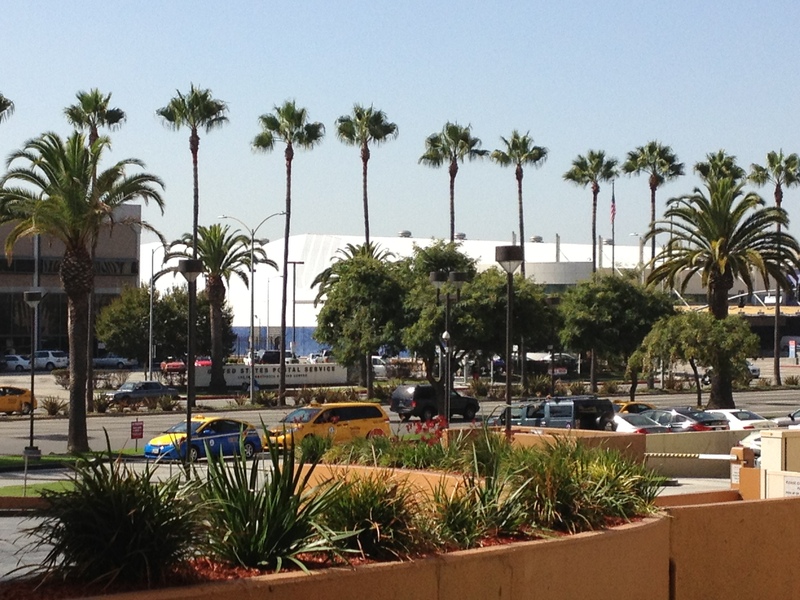 I loved the beautiful palm trees across the street from the hotel, and miss them. 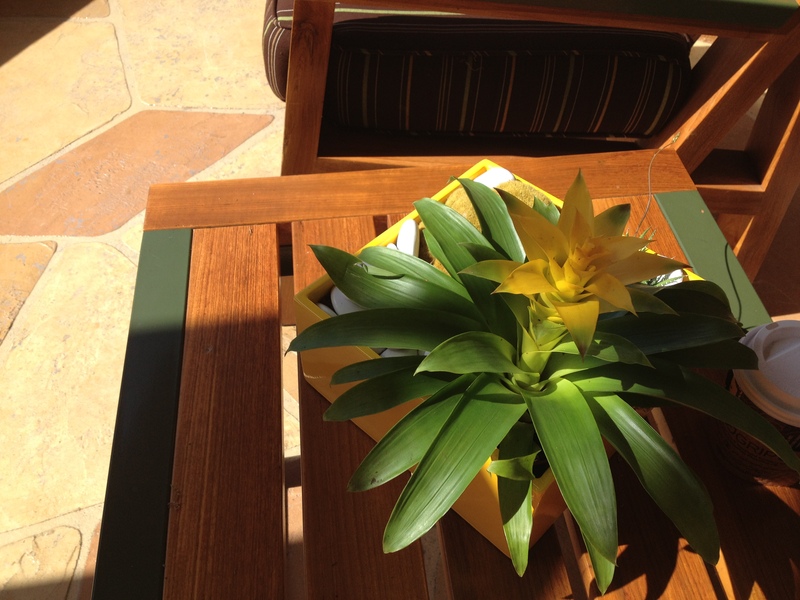 This pretty plant was outside on the patio. 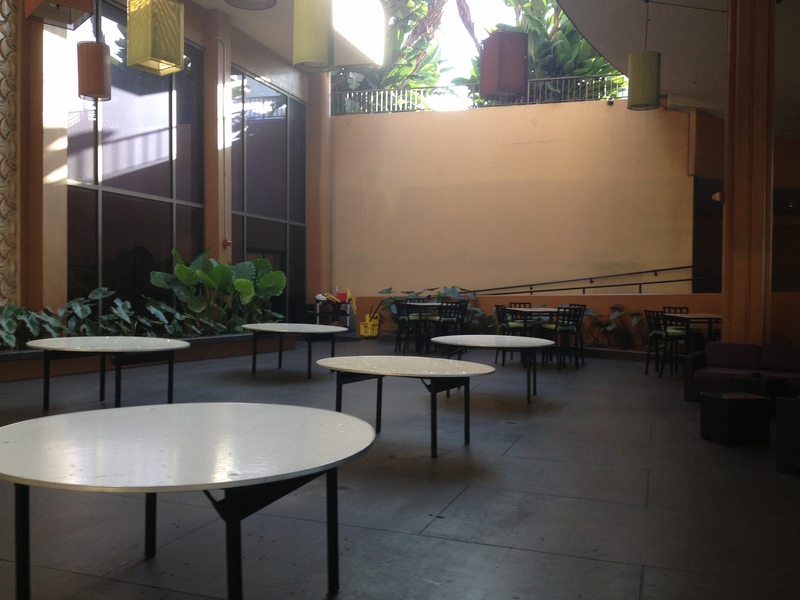 Here’s some of the lush, big plants/trees out on the patio. It was about 90 degrees while I was there. California doesn’t have the cool weather of fall or the beautiful colors of fall’s leaves like Missouri has, so when I arrived back home, my toes in my flip flops were a little chilly! 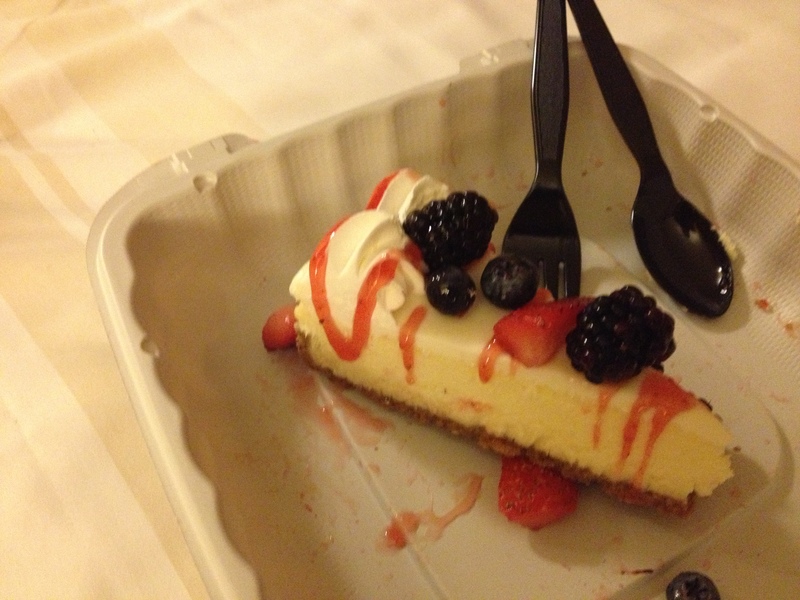 Of course, at the hotel I had to sample the New York cheesecake topped with strawberries, blackberries, and blueberries the night I arrived for a snack! It was delicious! 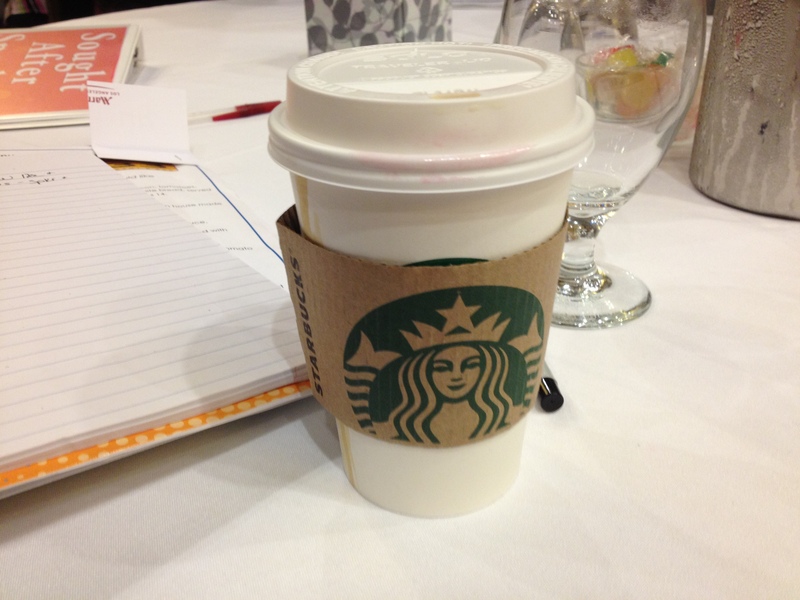 Heck, I’d already blown it the first day, so I might as well have a Starbucks latte’ the next morning! I tried to use the Starbucks’ free coupon that my sweet friend Shelley had given me for my birthday, but the staff said they didn’t accept coupons. At least they were really nice about it. Darn. I will just have to use the coupon here to get another latte’! Starbucks is the happenin’ place at the LAX airport Marriott. Every morning people were scurrying to the counter like ants to buy the steaming, creamy coffee and sweets. 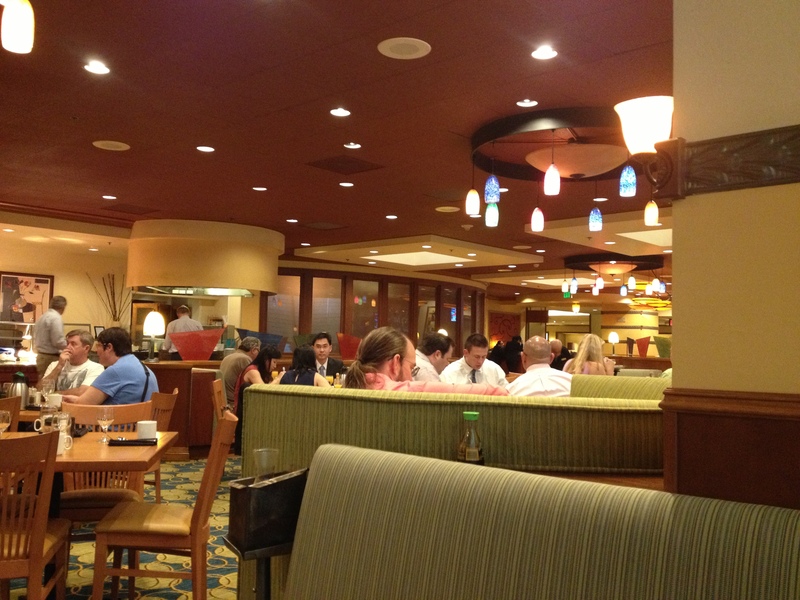 The Marriott Hotel has four places to dine inside the hotel, if you want to stay there. I ate most of the time at the Latitude 33 restaurant. It’s budget-friendly, the staff is great, but most importantly the food is good and the lights are way cool. One of the wonderful waitresses’ names was Oolah. She had such a sunny personality, filled with joy and positivity. I hope I’m spelling her name right. I asked what it meant. She is Swedish, but said the name is Celtic and it means, “woman with a will.” I laughed and told her that is me. She replied in her accent, “Yes, but we must be sure to turn that will in the right direction!” I said, “Yes, God’s way.” She then thanked me in agreement and winked. Later, I overheard two customers telling her what a great attitude she has. See the cool colored lights hanging down?! 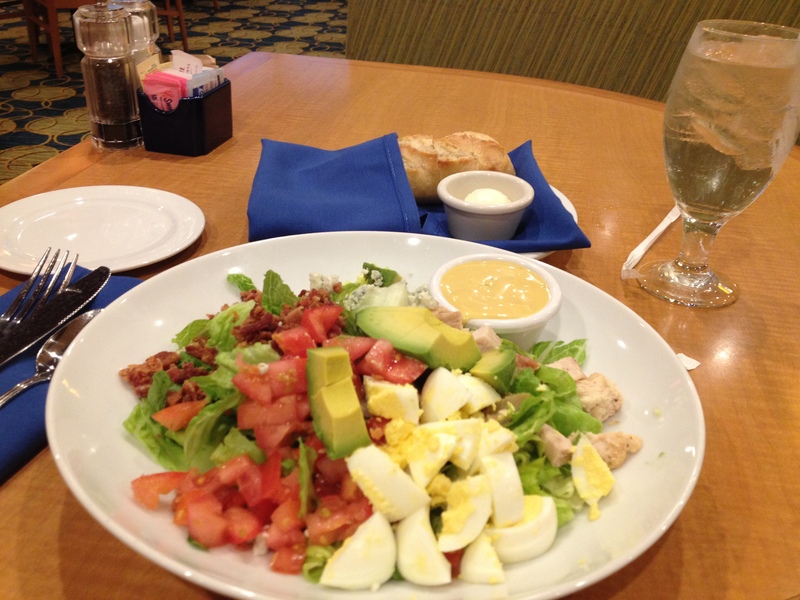 Their Cobb salad I had for two meals was like art with all its colors. Loved the avocado! Their warm, soft, buttered bread was too good. Isn’t this a pretty table? This is not a food blog, although I could fool you, couldn’t I? I will share more with you about the training itself in my next blog post, part 2. 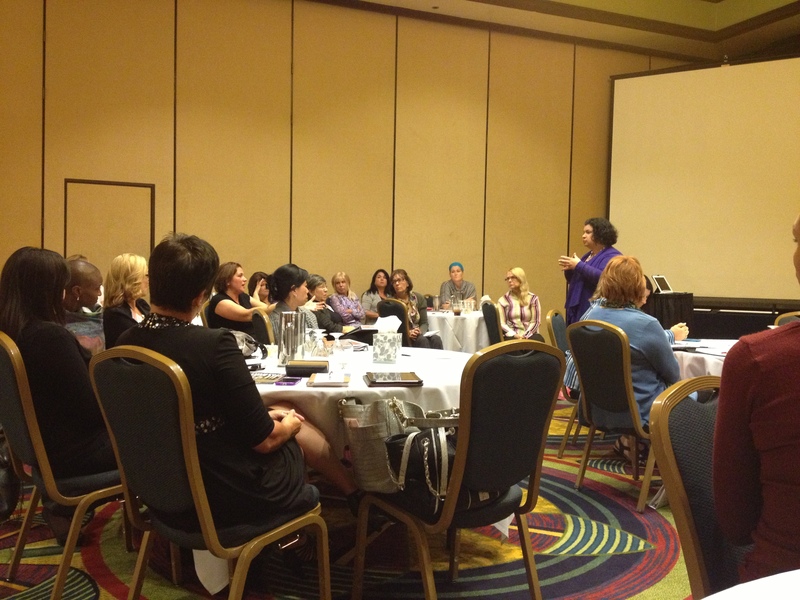 Do you need a dynamic keynote speaker for your women’s conference or event? I’d love to work with you to help make your event a great success! To book me as a speaker, email me at elizabethdjones@gmail.com or contact me here.